Study design of αGalCer-pulsed IL-2/GM-CSF-cultured PBMC administration. The timing of apheresis and cultured cell administration is shown. The first apheresis (▿) was defined as day 0. The patients received two injections of αGalCer-pulsed IL-2/GM-CSF-cultured PBMCs (▴) per course. The patients received two courses. Flow cytometry analysis of αGalCer-pulsed IL-2/GM-CSF-cultured PBMCs. A, The expression levels of HLA-DR, CD11c, CD86, CD40, CD1d, and CD83 on αGalCer-pulsed IL-2/GM-CSF-cultured PBMCs were assessed by flow cytometry analysis at the time of administration. Gray-filled histogram indicates background staining with an isotype control. Open histogram indicates staining profiles of the indicated molecules. 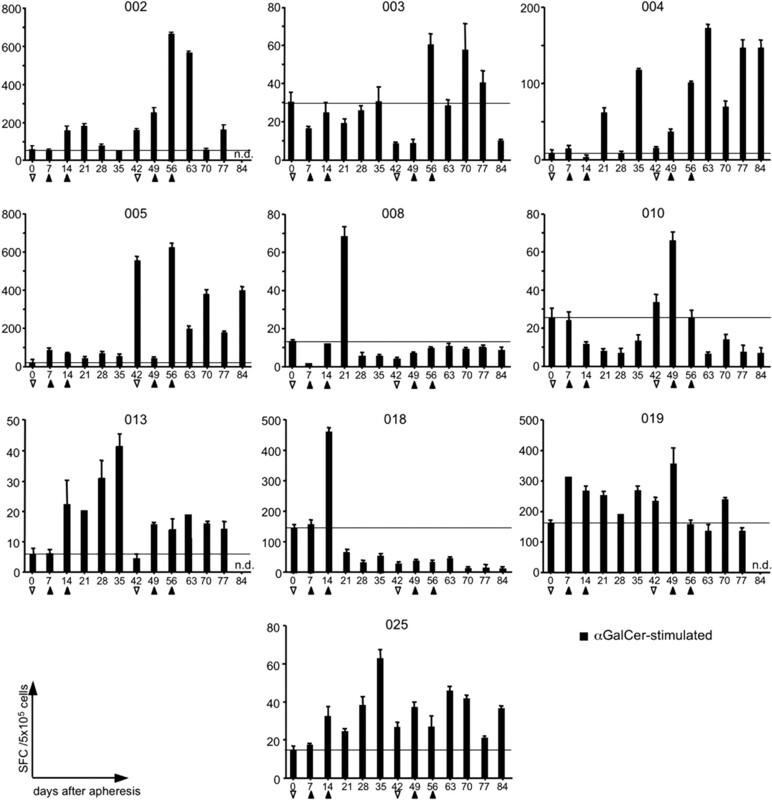 Representative data of IL-2/GM-CSF-cultured PBMCs (nos. 1–4 for case 003) are shown. 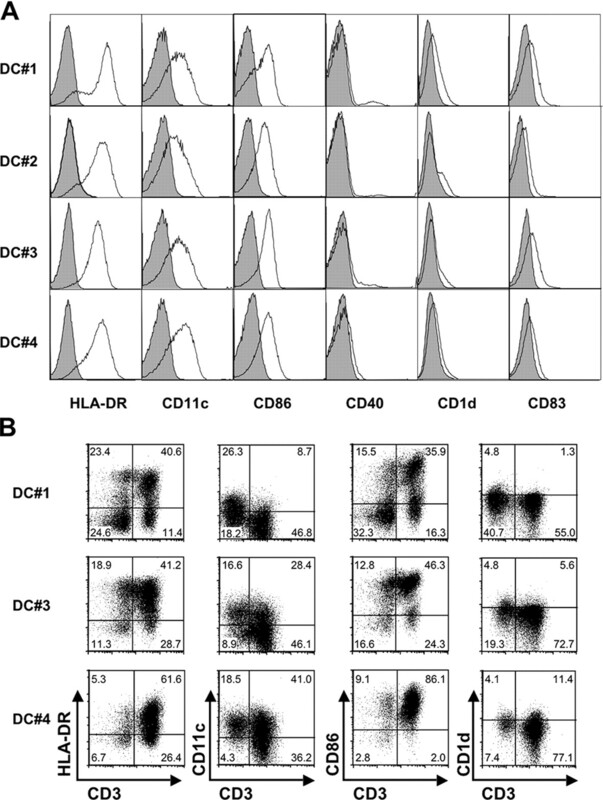 B, Representative flow cytometry profiles of the expression of HLA-DR, CD11c, CD86, and CD1d on CD3+ and CD3− cells in IL-2/GM-CSF-cultured PBMCs. The percentage of cells detected is represented in each quadrant. Number of circulating NKT cells and NK cells during the course of treatment. The percentage of peripheral blood Vα24+Vβ11+ NKT cells and CD56+CD3− NK cells during the course of the trial were monitored by flow cytometry analysis. The absolute number of NKT cells and NK cells in 1 ml of peripheral blood is calculated. Six cases whose NKT cell number clearly expanded after αGalCer-pulsed IL-2/GM-CSF-cultured PBMC injection are shown. Apheresis (▿) and αGalCer-pulsed IL-2/GM-CSF-cultured PBMC injection (▴) are shown. n.d., Not done. Increased numbers of peripheral blood NKT cells after the administration of IL-2/GM-CSF-cultured PBMCs. 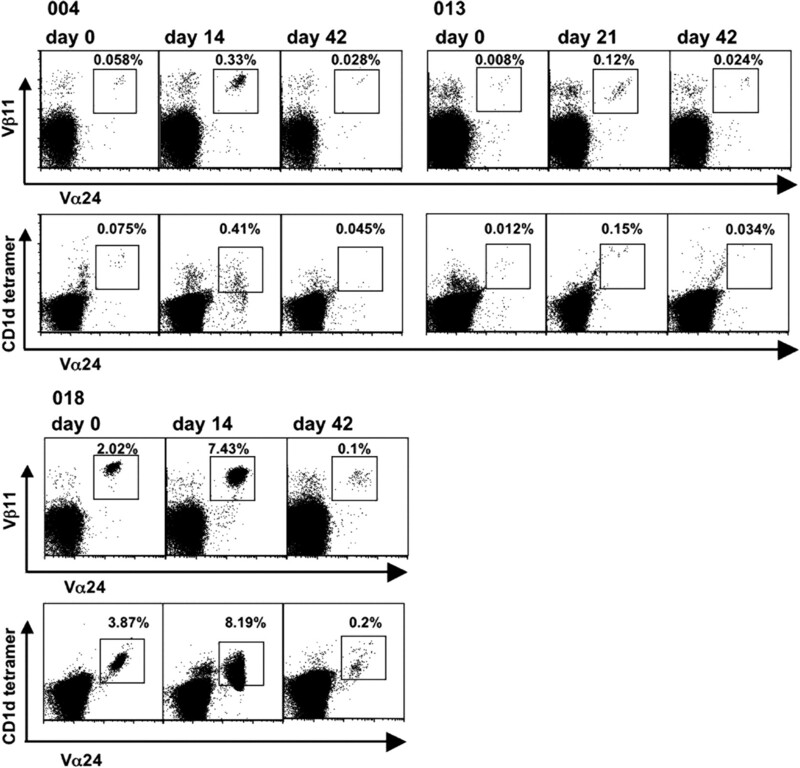 Representative flow cytometry profiles of Vα24+Vβ11+ NKT cells and Vα24+αGalCer/CD1d tetramer-positive NKT cells before and after IL-2/GM-CSF-cultured PBMC injection (cases 004, 013, and 018). The percentage of NKT cells in PBMCs is indicated at gate. Detection of αGalCer-reactive IFN-γ producing cells by ELISPOT assay. Cryopreserved PBMCs were thawed and cultured overnight in the presence of αGalCer. The number of IFN-γ-producing cells was quantified by an ELISPOT assay. Spot number with SD for triplicate culture is shown in 10 cases whose IFN-γ spot-forming cells (SFC) were obviously increased. Apheresis (▿) and αGalCer-pulsed IL-2/GM-CSF-cultured PBMC injection (▴) are shown. n.d., Not done. 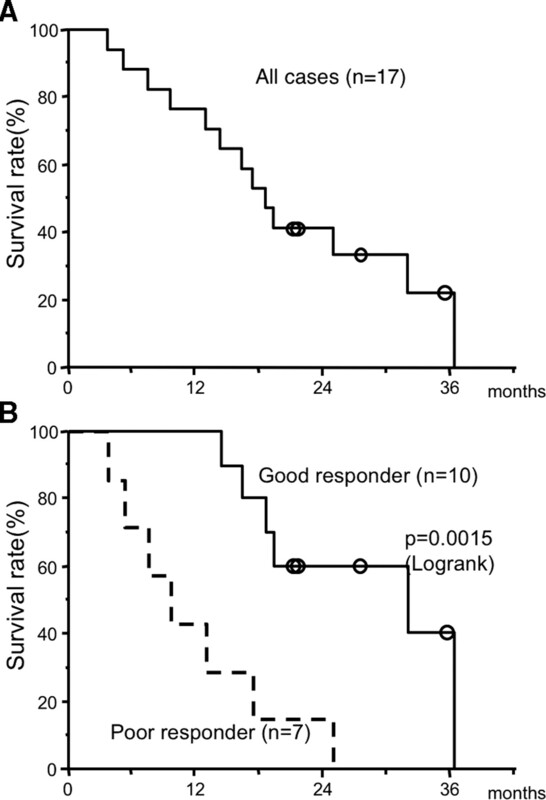 Overall survival of patients with αGalCer-pulsed IL-2/GM-CSF-cultured PBMCs. A, Overall survival curve of all patients i.v. administered four times with αGalCer-pulsed IL-2/GM-CSF-cultured PBMCs. B, A comparison of overall survival of good responders (n = 10) with increased IFN-γ-producing cells and poor responders (n = 7) without increase. a M, male; F, female; IV, c-stage IV; IIIB, c-stage IIIB; rec, recurrence after complete surgical resection; Ad, adenocarcinoma; Sq, squamous cell carcinoma; SCLN, supraclavicular lymph node; PS, performance status; CT, chemotherapy; ST, surgical treatment; RT, radiation therapy; DOE, dyspnea on effort; DVT rec., recurrence of deep vein thrombosis; GOT, glutamic-oxalacetic transaminase; GPT, glutamic-pyruvic transaminase; ALP, alkaline phosphatase; LDH, lactate dehydrogenase; Cre, creatinine; Amy, amylase; T-Bil, total bilirubin. 001 88.9 ± 7.3 41.4 ± 12.1 59.2 ± 11.2 3.3 ± 3.1 20.0 ± 8.8 2.0 ± 0.6 1.6 ± 0.9 72.9 ± 11.8 n.d. n.d. n.d.
005 94.7 ± 3.1 58.2 ± 12.5 64.7 ± 13.9 3.4 ± 3.4 33.1 ± 9.8 34.4 ± 7.1 n.d. 53.6 ± 12.3 n.d. n.d. n.d.
a Patients completed course of four αGalCer-pulsed IL-2/GM-CSF-cultured PBMC injections. b FACS maximal fold increase in peripheral blood NKT cell number. The time point is depicted in the parentheses. c ELISPOT maximal fold increase in IFN-γ-producing cell number. The time point is depicted in parentheses. SD, stable disease; PD, progressive disease; TTP, time to progression.